Every year, for the weeks and months before the garden opening, I am focused on getting the garden ready to meet its public. The opening is a wonderful opportunity to make sure that everything in the garden is looking as good as it possibly can be on that weekend. The downside of this is that a lot of other things in life are put on hold. So, when the opening is over, my thoughts tend to move on to other important things that have been neglected. This means that the garden tends to get on with things on its own in June. Don’t get me wrong, I don’t avoid the garden. I mow the grass, water plants and dead-head and prune where necessary, I just don’t have the garden at the fore front of my mind. Now, that period is over for this year and I am back to thinking about the garden again. Before I move on though, I thought you might like a quick update on the opening. It was a lovely sunny weekend and we made over £200 for the NGS Charities. I had been concerned that despite the dismal, cold weather we had this Spring, some visitors might have expected us to magically avoid all of it and have a garden with the plants that would normally be in flower in the first weekend of June. Thankfully I was totally wrong. 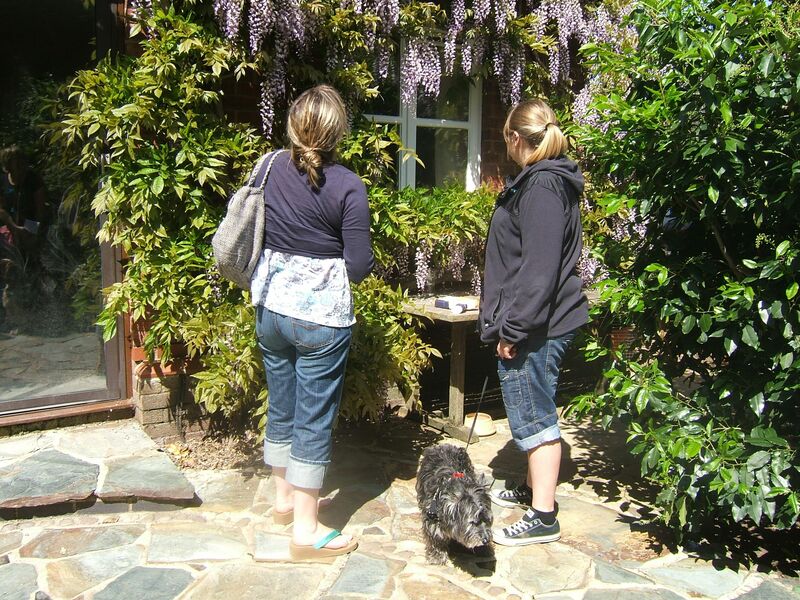 People really appreciated the chance to see the Wisteria in all its glory :). Certainly, over the years, I have come to learn that a different group of plants are in flower each time. This highlights how it is impossible to plan one’s flowering for a particular time of year. Yes, you can think that certain plants will be at their best, but you certainly can’t rely on that. Particularly in a small garden, it is best to plan for a succession of flowering.In larger gardens, it may be practical to walk past areas not at their best, but in the size of garden that many of us have these days, every inch of space has to work hard! We had a number of visitors making return visits, which was particularly gratifying. This year, we had three canine visitors, but they were not necessarily as interested in the garden as their humans. However, Anya was overjoyed to meet even more canine friends. I waited a few days to do my major wisteria prune this year and I am really glad I did so. We had arranged to have solar panels fitted and when I saw the scaffolding going up, I realised that this would be a really easy way of doing the pruning. 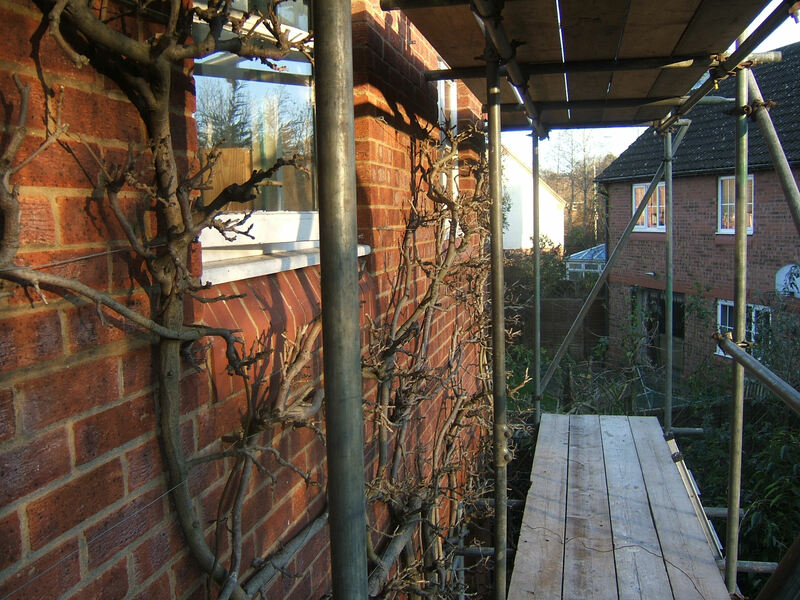 There would be no need to keep repositioning the ladder (which is not an easy task) – I could reach the whole of my wisteria from the first layer of the scaffolding. Imagine my sadness when the workmen went up a level and, having established a platform for the solar guys, removed the boards at the level I needed for my pruning. Fortunately, they had to come back the next day and so offered to bring some more boards for me :). I have never pruned the wisteria so easily. The whole job was done in two 30 min sessions. There was a slight downside though – I suffer from vertigo sometimes and getting on the ladder to come down was not an easy thing to do! There were only two shoots that had managed to get themselves so embedded in the house that they did not come away easily. Fortunately, there was a workman on the upper level who quickly solved my problem. Next year, I will definitely be looking into the cost of putting up scaffolding to do the job again. For some reason it is only after Christmas that the Wisteria seems to call me for its winter prune. Before that, it just seems to be doing fine and then after the holiday, it suddenly seems in dire need of a serious prune. As many of you will know, I usually do (or at least start) the job on New Year’s Day, but this year the weather was so wet and gloomy that I only started on the job today. If you have a wisteria to prune and are not confident as to how to do it, take a look at the video I did of the process last year. Some friends of mine watched the video last year and after pruning their wisteria, had blooms on it for the first time last spring. I can’t promise that this will happen for you as the plant has to be mature enough to flower, but if lack of pruning was the cause for few or no flowers, then the video should help. Even if the plant isn’t ready to flower yet, pruning is important in establishing a framework for the future. If you don’t get the structure right from the beginning then you can get congestion points or “knots”. Here a side shoot has grown and forced itself behind a main stem. This has created a very congested area where it is virtually impossible to get in to remove material. In previous years, I have pruned as much as I could, but the problem just gets worse as each year even more shoots make the problem worse. This year, I will prune all around the area to give myself as much visibility as possible. I will not worry about the three bud principle as I am not trying to get flowers here, but rather to resolve the congestion. I will then take my pruning saw to the major offenders and hopefully that will sort the issue out. Hopefully this will be in the next week or two and I will post after the job is done to let you see the results. 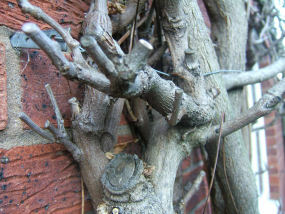 Unsure of how to give your wisteria its winter prune? Check out this video and you should be confident to get on with the job. The winter prune not only keeps the plant tidy, but also helps to produce more flowers. Please remember that wisteria seeds are poisonous to dogs, so don’t let them fall to the ground where dogs could find them. 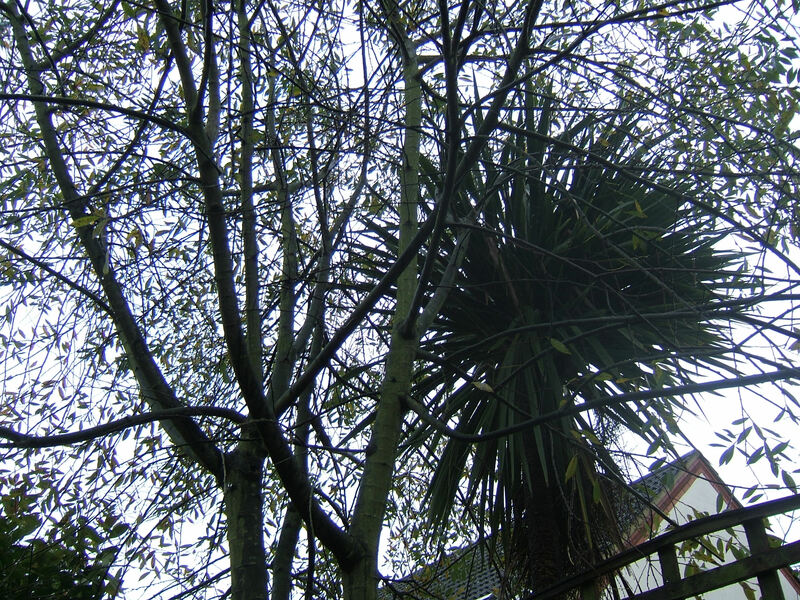 When I am pruning high up a ladder, I cut off the seed pod and put it in my pocket and then trim off the rest of the stalk and let that fall to the ground. When the job is finished, I obviously tidy up well to make sure that I didn’t miss anything. If you found this useful, don’t forget to check out our other videos. This is a real garden and so not quite as pristine as one at the Chelsea Flower Show, but in my own way, I have an understanding of what those gardeners go through. I am now at the titivating stage before next week’s NGS opening. 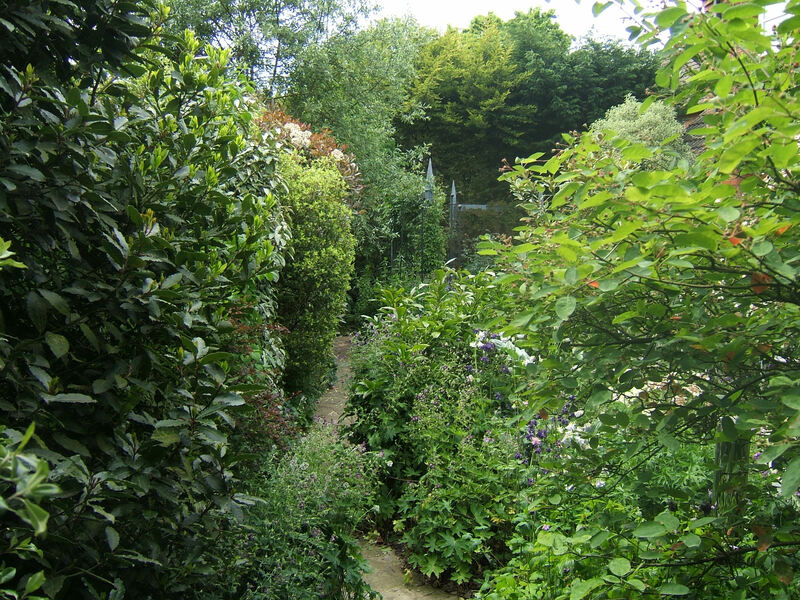 For myself, I am happy to have the plants spilling over the paths in gay abandon, but I know that visitors would like to actually see the paths in front of them. 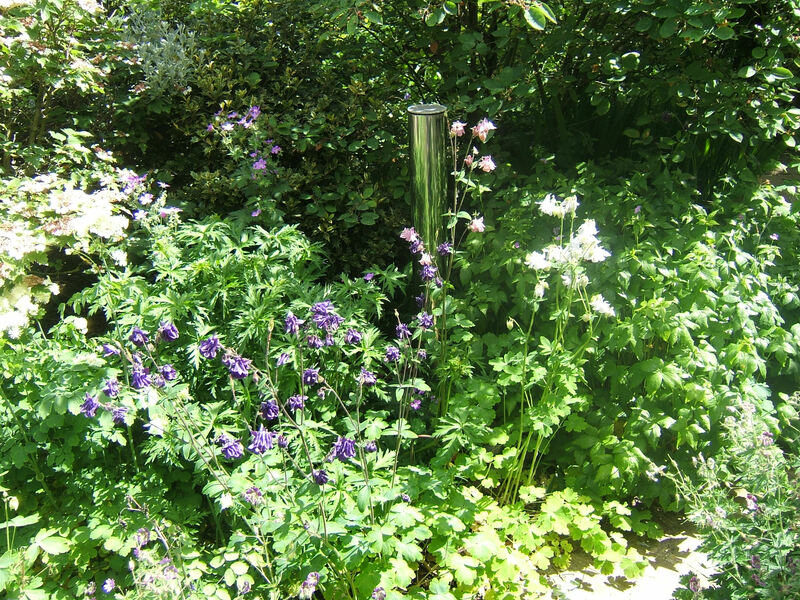 So this weekend, the job has been to persuade the plants to stay behind the border edging plant supports I have. 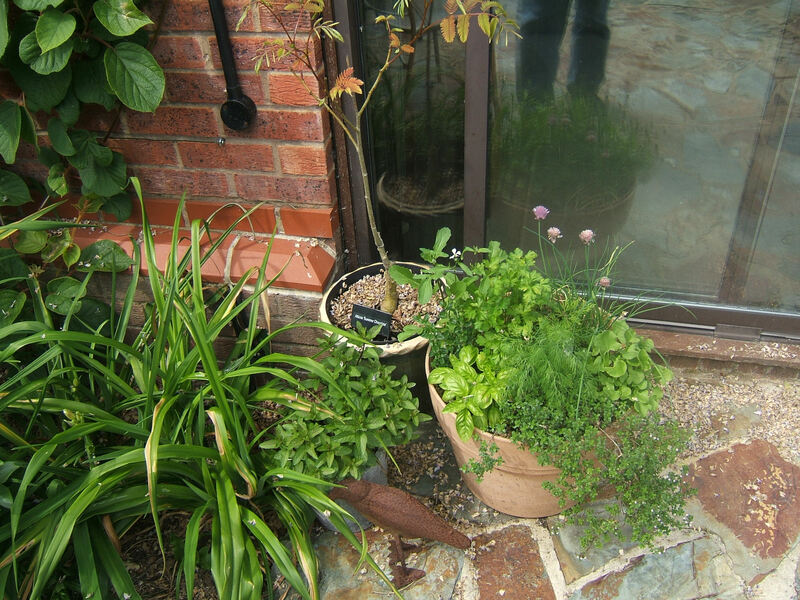 Whilst they are also made from metal and robust, they are different from the ones that I use to protect individual plants from the unwanted attentions of the dogs. If you are interested in this type of support, check out Snape Stakes. In the next week, the plants should grow enough to hide the supports whilst still benefitting from them. I am spending my time wandering around the garden and watching for anything that looks out-of-place. Never before have I had to dead headed Aquilegias as they are usually over by the time of the garden opening. They are looking wonderful at the moment and I am just praying that they can manage to hold on for another week. The bay that I had to avoid pruning earlier in the year as it was home to a blackbird nest has now had its annual trim, and the stock of bay leaves for the kitchen has been replenished. Any yellow leaf that I see is whipped of the plant – everything is so late this year that the evergreen shrubs are still losing last year’s leaves. The big job left is sweeping the paths – this has to be done again and again. The remnants of the wisteria’s flowers are still trying to carpet the garden. Obviously they have competition from other plants which are dropping leaves and flowers too. Then there are the bits of wood chip that the birds clear out of the way in their search for worms. I used to blame the dogs for this until I realised that it happened even if the dogs hadn’t been out. In other posts, I have mentioned that the wisteria is a thug. It grows so fast that it can be hard to keep it under control. 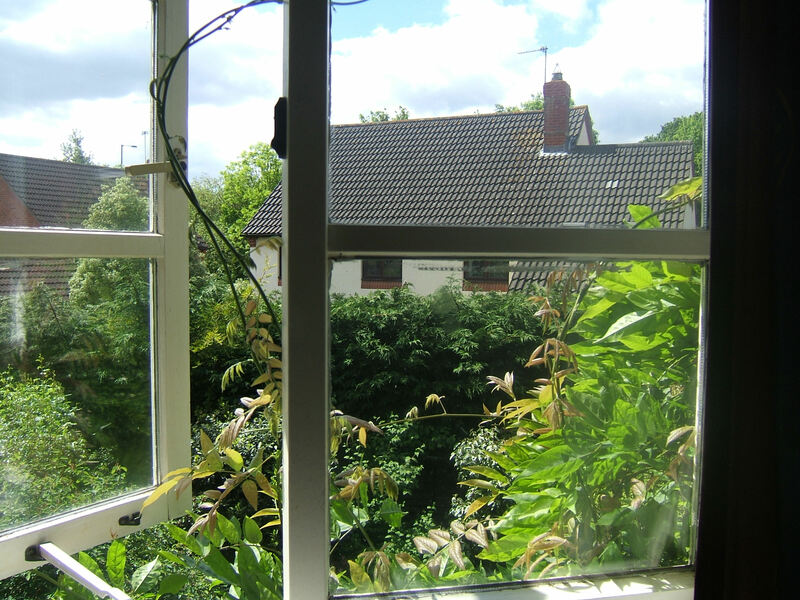 One of my more unusual jobs is to go upstairs and prune what I can reach from the bedroom windows. 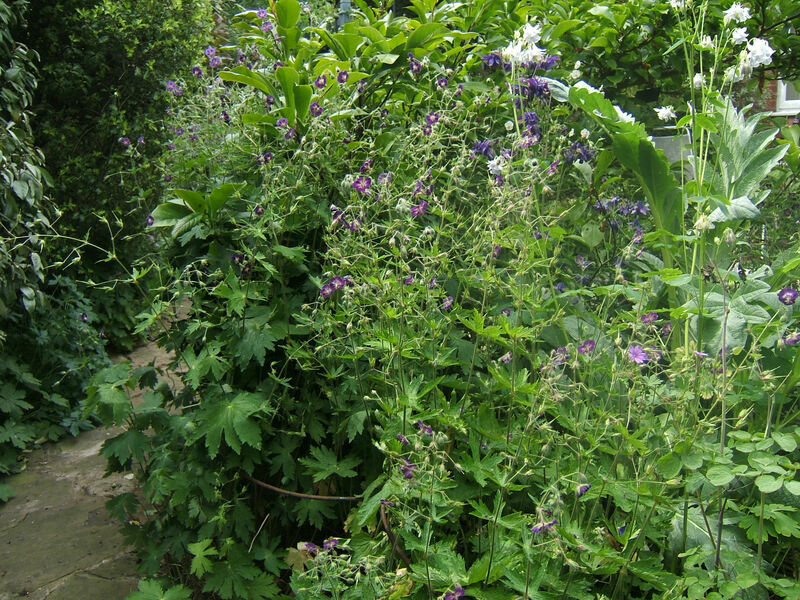 But next weekend, the garden will be lovely – and all the big jobs I have to do each year will be done. After the opening, I can sit back and enjoy my garden without having to worry too much. A new video is now available, featuring our wisteria.